Club Med Les Arcs Panorama is officially opening to guests on December 16, 2018. This resort is the new flagship to represent Club Med’s unique family mountain/ski experience. The resort is situated in the Savoie region and is part of the Paradiski domain, one of the world’s largest ski areas. It features a modern architectural design nestled into an enchanting Alpine forest with panoramic views of the Tarentaise Valley and its peaking mountaintops – perfect for both winter and summer vacations. The resort holds 433 rooms with various styles of accommodations for each traveler type: Superior Rooms, Deluxe Rooms and Suites. The 4-Trident resort features an Exclusive Collection Space, La Belvédère, which features 24 luxury suite accommodations and a range of personalized areas and service, including a dedicated ski room, private terrace with hot tub, private concierge and room service, and its own bar area serving Champagne in the evenings. The resort offers three signature dining concepts, one of which is a new venture dedicated for families. Bread and Co., the family restaurant, is an interactive experience for children and parents to gather and be part of their own culinary story as they play chef and prepare their meals together. Club Med’s all-inclusive ski element is unmatched in the industry. Aside from the usual Club Med perks such as accommodations, meals, beverages, activities, Wi-Fi and nightly entertainment, the ski resorts also include ski lift passes and ski/snowboard lessons for guests at no extra charge for the duration of their stay. After a day on the slopes, guests can then finish the day with a relaxing massage at the Spa by CINQ MONDES and let their kids make new friends at the children’s clubs. With a heavy increase in interest and business from the United States for its ski market, Club Med has tapped into its first-ever ski ambassador to help communicate its news offerings and showcase the unique elements of its ski product. Club Med has appointed Olympic Gold Medalist Julia Mancuso as its first ski ambassador. Mancuso is known for many different roles: she’s a world-class skier, model, and philanthropist, but she is most known for being the most decorated Olympic female American Alpine skier. She broke into the World Cup at just 15 years of age, and currently boasts seven World Cup wins, five World Championship podium finishes and four Olympic medals (including a gold in the giant slalom of the 2006 Winter Olympics). 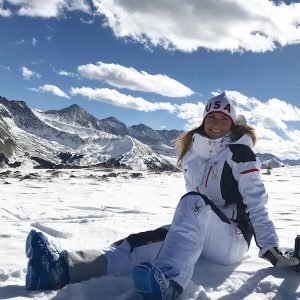 Aside from her impressive athletic resume, Club Med identified Julia as a great ambassador due to her quirky personality and free spirit, as well as her interest in the brand’s ski offering. Mancuso will be traveling to Club Med’s newest ski resort, Les Acs Panorama, this winter to help celebrate the grand opening, experience its ski offering and share her experience with her fans. One year after the initial announcement of Club Med’s first-ever ski resort in Canada, the company and its partner, Groupe Le Massif, are revealing the first look at the resort’s architecture and design. Club Med Quebec Charlevoix will be the first resort venture into the Canadian market for Club Med, and marks the much-anticipated return of its ski offering to the North American market. With the resort’s plans to be open year-round, guests will not only discover its mountain and ski offering, but also get a glimpse of the region, its activities, delicacies, culture and the people. Maintaining the region’s distinctive character is an important cornerstone of Club Med’s development plans as it follows its core values of social responsibility and sustainable development. The company is currently pursuing two recognized sustainability certifications for this inaugural resort. Club Med is looking to be the first hotel structure in North America to comply with strict BREEAM environmental standards and it is diligently working towards sustainable operations management of the resort in order to become Green Globe-certified by opening day. “We’re especially proud to partner with Club Med to welcome the first mountain resort in North America,” says Frédéric Sujobert, Vice President of Operations, Groupe Le Massif and General Manager, Le Massif de Charlevoix. “Working with local stakeholders, we will develop a one-of-a-kind offer focused on mountain experiences while highlighting the Charlevoix region.” Both companies are working together with local suppliers to offer guests a variety of experiences in Charlevoix. Club Med and Groupe Le Massif have partnered with Quebec architecture and design firm Lemay Michaud to bring their exclusive resort model to life. Inspired by the region’s beauty and dynamic character, the resort’s design is reflective of the surrounding landscapes, colors and climate. To echo the heart of the year-round resort located at the highest altitude in eastern Canada, Lemay Michaud brings fall and winter scenes to life through stone and wood carvings within the resort’s structure. With its inspiration mirroring traditional Quebec culture, Club Med designed the facilities’ stone walls, wooden siding and terraces to capture the essence of authentic local culture while adding its own modern twist. For more information, visit clubmed.us. Club Med, founded in 1950 by Gérard Blitz, is the pioneer of the all-inclusive concept, offering nearly 70 premium resorts in stunning locations around the world including North and South America, Caribbean, Asia, Africa, Europe and the Mediterranean. Each Club Med resort features authentic local style and comfortably upscale accommodations, superior sports programming and activities, enriching children’s programs, gourmet dining, and warm and friendly service by its world-renown staff with legendary hospitality skills, an all-encompassing energy and diverse backgrounds. Club Med operates in more than 30 countries and continues to maintain its authentic Club Med spirit with an international staff of more than 23,000 employees from more than 110 different nationalities. Led by its pioneering spirit, Club Med continues to grow and adapt to each market with more than 14 new resorts opening within the next three years. For more information, visit www.clubmed.us, call 1-800-Club-Med (1-800-258-2633), or contact a preferred travel professional. For an inside look at Club Med, follow Club Med on Facebook, Twitter, Instagram and YouTube.